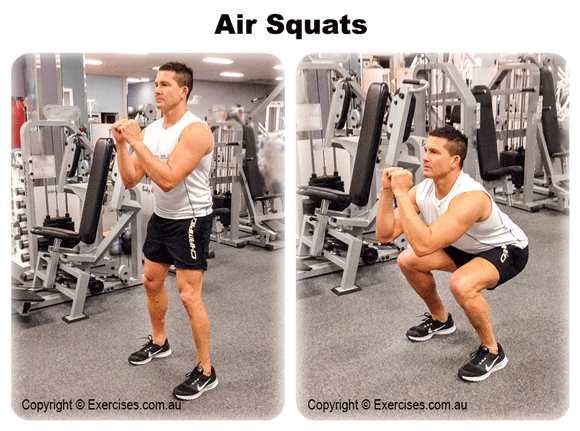 Air Squats is an effective exercise for building the muscles of your quadriceps, hamstrings and gluteus muscles. It also activates the core muscles to maintain an upright upper body position and support the lower back. Air Squats can be done as a book end for your workout. You can use it to warm up your hips, knees and legs before training legs or Deadlifts. You can also use Air Squats as a finisher at the end of a heavy leg workout. Assume a shoulder width stance with your feet slight angled out and keep your arms alongside your hips. Tighten your core, inhale then descend to a squat by bending at the hips, moving your glutes back and bending the knees. Keep your back flat, chest out and shoulders back throughout Air Squats. Swing your arms forward, maintain a 90 degree angle in the elbow bend until your hands reach chin level. At the bottom position, your knees should just be in line with your feet. The hips must be lower than the knees. Your weight must be on your heels. Keep your core tight and back flat at the bottom. Squat up by pushing through with your heels; the weight moving to the balls of your feet. Extend the knees then the hips. Keep your back flat. Do not lock out your knees at the top position. Air Squats are especially effective when you can maintain the form and follow a cadence. It is important to keep your back flat and tight core to protect your lower back and to make sure your knees do not extend past your feet. You can use an arm swing to add speed to Air Squats or simply keep your hands on your hips or clasped behind your head.